Last week, we looked at the split in the sector between companies focused on growth or profit. This week, we look at the other side of the equation – the owners. Why is there such an imbalance between the investor groups across the sector? Let’s start by looking at the breakdown of investors in the international payments space. The growth in the sector has been funded primarily by venture capitalists to date. A smaller number of companies are owned by private equity, but very few have attracted strategic investments or banks. Is it a simple question of a sector lacking scale, or is there more to it? Venture Capital (VC) is the staple funding model to fund growth in a sector. VCs, primarily based in the US or the UK have driven the growth to date, largely because Asia has been behind the regulatory curve. In particular, VCs love the consumer end. This is unsurprising, as consumer businesses have the ability to grow much faster than B2B (Revolut & TransferWise, case in point). PE has been much less active in the space for a number of reasons. First, PE companies’ typical debt structure requires profit to pay for their debt and many companies have yet to hit profit. Second, there are few businesses in the space that have reached enough scale to be interesting and mature enough to a PE firm in the first place. International payments has yet to generate a billion dollar plus deal. 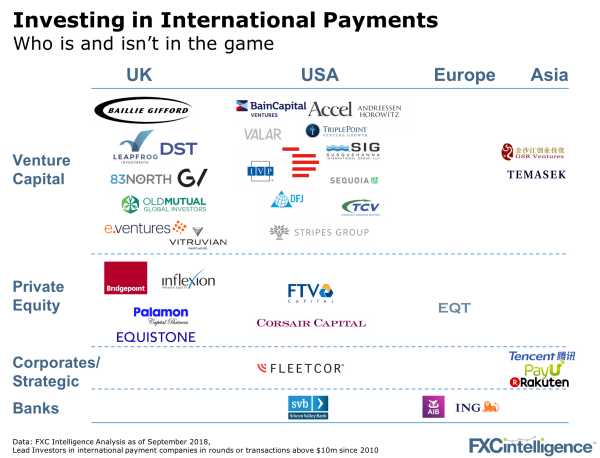 We are beginning to see corporates make strategic investments in payment companies. Some of this is coming out of Asia with Tencent investing in Airwallex or PayU and Remitly, for example. Corporates outside of Asia are also making moves, with US-based Fleetcor fully acquiring Cambridge Global Payments back in 2017. Very little M&A has taken place over the last year – PayPal acquired Hyperwallet – but otherwise it’s been pretty quiet. Perhaps the most surprising activity (or lack of it) comes from the banks. For all the talk of banks partnering with fintechs, international payments has seen very little activity. Transfermate has nabbed both AIB and ING, but thats pretty much the only story aside from some debt from Silicon Valley Bank and a handful of white-label partnerships across the sector (e.g. TransferWise & BPCE, moneycorp & Sainsbury’s Bank). Some banks can still command a price premium for trust (but it’s not clear this can remain given the continued price pressure from the fintechs). If you’re looking to raise money or thinking about what to expect next, start from the top of this list and work your way down. The size of the checks being written within the space is increasing as companies continue to grow and they are requiring more capital to scale. Once these companies hit profitability, Private Equity might get interested. And every so often, a company will offer enough to move the needle at a big corporate or bank.